I've decided to start a new feature that pays tribute to the men and women of wrestling who are no longer with us. Earlier today, I reposted my blog on the late, great Owen Hart since May 7 is his birthday. I also discovered Hart shares a birthday with the Hercules Hernandez. He would have been 56 this year (2012), but sadly Hercules died in his sleep in 2004 of heart disease. My first memories of Hercules date back to the mid 1980's when Sunshine brought him in to World Class Championship Wrestling. He was briefly a baby face, but turned on Sunshine and I think joined Devastation Incorporated. While in WCCW, I remember him wrestling on Bill Watts MidSouth wrestling show too. He and Gino Hernandez (another star I'll highlight with this series) against two of my favorites, Kerry Von Erich and Hacksaw Jim Duggan. Von Erich pinned Herc after Duggan hit him with a coal miner's glove. It wasn't long after this that Hercules moved to the WWF. He dropped the Hernandez surname and became just Hercules. He carried a long chain and if memory serves me right, he was managed by Classy Freddie Blassie up until the Fashion Fad Plate's retirement. Slick took over Hercules' contact only to "sell" it to sell it to Bobby "the Brain" Heenan. Under Heenan, Hercules seemed to prosper. He wrestled Hulk Hogan on an episode on Saturday Night's Main Event. The strongman even got the champion up on his shoulders in his torture rack finisher. Of course Hogan rallied, but it was quite a site to see the mighty Hulkster writhing in pain at the hands of Hercules. He entered a feud with Billy Jack Haynes in which I don't really think either man got the upper hand. One Hercules' biggest wins in my opinion came at the SNME prior to Wrestlemania III where he won the battle royal. Guys like Hogan, Andre the Giant, Paul Orndorff, and Haynes were all a part of it. After a double count out match with Haynes at Mania, Hercules went on to have a program with newcomer the Ultimate Warrior. Clearly, the Warrior was brought in to be a big star and he easily dominated Hercules. After being lost in the shuffle for a bit, Herc turned face when Heenan "sold" his contract to "the Million Dollar Man" Ted DiBiase. Hercules wanted no part of that and feuded briefly with the MDM, only to come up on the losing end. He did score another impressive win, this time at Wrestlemania V when he pinned King Haku. But he never really escaped that level of competition. Hercules eventually turned heel again and teamed with Paul Roma as Power and Glory. 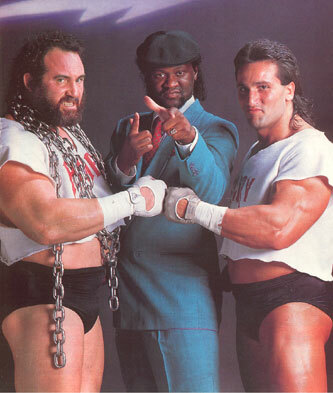 Slick managed the duo, and at one point I thought they might have tag team gold in their future, but it never happened. Hercules eventually left the WWF in 1992 and headed to WCW as "Super Invader". He wore a mask and I don't know how many fans actually knew it was him. Later in the year, he left and ended up on the Indy scene until he retired. Despite never winning any gold in the WWF, Hercules was a definite fixture in the Heenan family. Only time will tell if the company decides his career was worthy of induction into the Hall of Fame. But for now, I'll remember him fondly and wish him a happy birthday and a rest in peace. It has been a long time since you posted this, but I just saw it today for the first time! I am the oldest daughter of the late Hercules Hernandez! Thank you for keeping his memory alive! He definately deserves to be in the Hall of Fame!